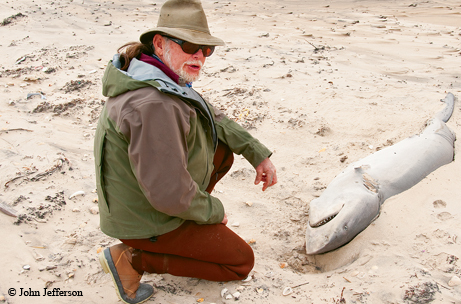 Vietnam vet finds new life of coastal conservation. After two tours of duty in Vietnam and one at Guantanamo Bay, Billy Sandifer was fed up with modern society. He wanted nothing more to do with a world of men. Sandifer retreated to Padre Island National Seashore and lived alone there from late summer 1977 until the spring of 1979. Alone? Well, he made friends, in his way — with coyotes. Sandifer had always been fond of them and enjoyed their company during his island sabbatical. He was always careful, though, not to tame them to any extent that could get them killed if they ventured too near the wrong humans. Sandifer refrained from luring the coyotes into camp for food and fresh water. He coexisted with them in much the same way as the young biologist in Never Cry Wolf who, sent to document wolves killing caribou, lived in sight of a wolf family and grew to respect them. Asleep on an old Army cot one night, Sandifer was suddenly overpowered by a putrid smell close to his face. Cautiously, he opened one eye. To his surprise, roughly an inch from his nose was a curious coyote with extremely bad breath. Sandifer reacted instinctively, licking the coyote on its nose! He probably never considered that the coyote might bite him. When you live alone for long periods of time, opportunities for socialization don’t come along very often. The poor coyote was at first stunned, then thoroughly repelled. If the pungent smell of a coyote’s carrion-rich breath would wake a human, how much worse would a coyote feel about human tongue scent on its nose, revisited with each breath? 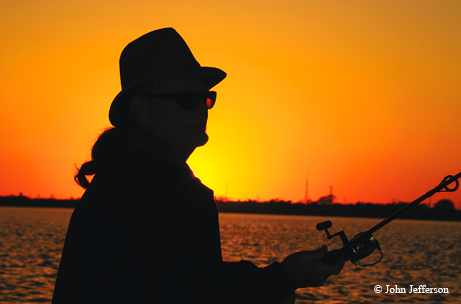 For Sandifer, Padre Island is his refuge, his homeland. One worth fighting for. Over the years, he has become a leading protector of the island and its wildlife in ways both large and small. Sandifer grew up as a rebellious kid willing to fight to be free and live life on his terms. He had one job on a shrimp boat, out of sight of land for 28 days. Another was as the 155-pound bouncer in a biker bar. He left a farm south of Alice to become a Seabee and then a combat Marine. Apparently, he was very good at what he did. He has no medals to prove that, however, since he says his anger led him to throw them all into the sea one day. During marksmanship training, a supervisor observed his accuracy and called him “Audie.” Sandifer, not knowing that “Audie” referred to Audie Murphy, another Texan, who was an excellent marksman and became the most decorated U.S. soldier in history, told him instead that his name was Billy Sandifer. He later became a member of the Marine rifle team. In Vietnam, Sandifer was exposed to Agent Orange, a toxic jungle defoliant. He came home with persistent headaches from the spraying. He also suffered from seeing — and hearing — his comrades in arms die. That breeds bad dreams. Awful ones. He leapt out of bed recently, dreaming he was facing a machine gunner whose finger was on the trigger. The government did not officially recognize or treat until recently what is now called post-traumatic stress disorder. Nowadays, veterans receive help for it. Sandifer didn’t. So, when Sandifer returned home, he went to the island for the healing he couldn’t find elsewhere. Old friends would stop by and visit him when they were on the island. Sometimes he would give them a shopping list of things he wanted the next time they came. His usual breakfast was Rice Krispies and water. His other meal was a couple of cans of corned beef hash and canned green beans. “I’m not a very needy person,” he explained. As his fishing skills and knowledge of the island and the surf blossomed, he began guiding fishing excursions. That later expanded to shelling, birding and turtle trips as his ability to navigate the island and the treacherous sand made his services more valuable. Sandifer probably knows Padre Island as well as anyone alive. He stopped at Big Shell, a remote part of the island, to show me broken shells polished smooth by eons of wave action. Years on the island and in the surf have taken some of the rough edges off him, as well. He now usually prefers to walk away from confrontations. But I wouldn’t push it. Entering the Padre Island National Seashore, he pointed to a conspicuous yucca jutting up from the salt grass. “I planted 128 of them,” he told me. “They used to be indigenous to the island, but hurricanes, landscapers and others wiped them out. I thought they ought to be here.” It took persistence to persuade the government to allow that. It took even more for him to sell the idea of conducting a Big Shell Beach Cleanup. This is now the 15th year of the massive trash pickup. In 2009, 502 volunteers helped pick up 800,000 pounds of trash, assisted for the first time by Padre Island personnel. Sandifer is also a warden for the Audubon Society in the Upper Laguna Madre and assists in other conservation work on the island. We were looking for seven bull sharks that had been “finned” by Mexican fishermen. They catch a shark, cut off all the fins to sell and leave it to drown in the gulf, unable to swim without fins. We found four. It was a grim sight. Sandifer was livid, and once again disappointed in his fellow man. As tough as one might expect a former Marine to be, Sandifer has respect for all living things on the island and in the sea. A client once caught a large hammerhead shark that was exhausted when he finally reeled it close. It made one last lunge, broke the line and became hopelessly entangled in the 13-foot leader. It was certain to die. Sandifer brought the fish ashore by hand, removed the hook and leader and walked it back to deeper water. It was nonresponsive. He massaged it and walked it back and forth, talking to it all the time. As it gained strength, Sandifer lost his balance and was afloat, holding onto a large, swimming man-eater. He hung on for several minutes, and then finally let the big fish slip through his fingers. He swam beside it for a minute, telling it goodbye.